Born of a Dorset family, Humphrey Lynd was knighted in 1613 by James I. 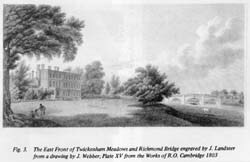 He came to live at the house later known as Cambridge Park, in Twickenham in about 1616. At the time the property was second only in size to Twickenham Park, at 74 acres, and he probably built the mansion. According to Edward Ironside he also bought land in Whitton to start a warren and built a house there subsequently occupied by Thomas Annesley. His family name was variously spelt as Lynd, Lynde or Line. Humphrey devoted his life writing in the cause of religion, tilting at the Church of Rome. One of his tracts, Via Tuta provoked a response from a Jesuit priest entitled A Pair of Spectacles for Sir Humphrey Lynd to which he responded with A Case for Sir Humphrey Lynd's Spectacles. He would have seen the publication, in 1611, of the new translation of the bible, sponsored by his monarch. His five children, four daughters and a son, also Humphrey, were born at Twickenham and their baptisms recorded in the registers of St Mary the Virgin. Succeeding to a family estate near Cobham in Surrey the family moved away in 1630. Where, falling ill, he died on 8 June 1636 testifying with his last breath his constancy to the reformed church and was buried in the parish church at Cobham. he died "testifying with his last breath his constancy to the reformed church"